Vector Blogger Template is a professionally designed, clean and elegant looking blogger theme with simple and easy to customize appearance. Loaded with tons of features it is a latest generation theme with newest features including blogger’s new layout and commenting system. This theme is ideal to create blog on any niche but it is best suited for sites that deliver newsabout Technology, Fashion, Sports, Video, Healthy, Travel, etc. Made with perfection it is highly seo optimized theme with fast loading and responsive design, that can easily fit any screen size or device, whether its a desktop, laptop, macbook, ipad tablet or smartpone, it will look beautiful on any screen. 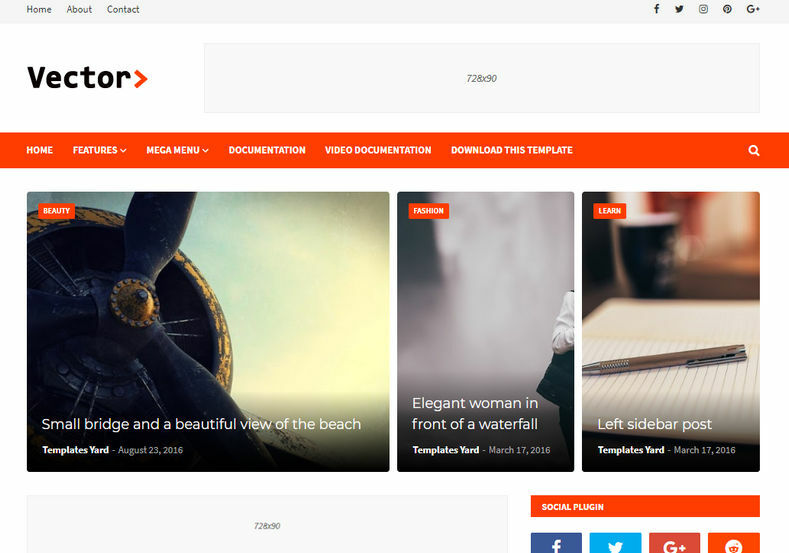 Built with classy and elegant color combination of red white and black, it support blogger’s template customizer. Seo Ready, Browser Compatibility, Responsive, Adapted From WordPress, Social Bookmark Ready, Post Thumbnails, Ads Ready, Drop Down Menu, White, Black, Red, Fashion, Elegant, Simple, 2 Columns, WhatsApp Sharing, Magazine, News, Breadcrumb Navigation Ready, Business, Blogger Layout Version 3.0, 1 Right Sidebar, Right Sidebar, 2 Columns, 3 Columns Footer.